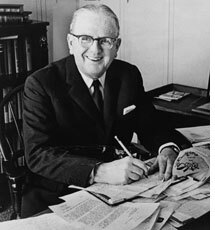 Norman Vincent Peale was a minister and the author of the famous book The Power of Positive Thinking. That book and other works from Peale went on to sell tens of millions of copies. During the depression he, JC Penney and Thomas Watson â€“ of IBM fame â€“ spent time on philantrophy. Peale also had his own radio show for over half a decade. Focusing on this day today and on tomorrow when it arrives can save you a lot of stress and improve your focus and performance. Of course, you may need to plan for tomorrow. But thinking about it compulsively will just shatter your focus and ensure that you wonâ€™t be able to concentrate on whatâ€™s in front of you today. You can – over time – build a habit of spending more time in the present and less time in imagined future scenarios or old memories. You may do this through things like focusing on your breathing or on your inner body. You can read about in 8 Ways to Return to the Present Moment. 2. Donâ€™t walk around with the world on your shoulders. I wonâ€™t spend much time on this point because I mentioned it just a few days ago and have written about many times before. Itâ€™s important though and can really change how you see the world and your life. It makes most things lighter. Check out Lighten Up! for practical tips and foundations for learning to think about things this way. And have a look at the last part of How to Keep Yourself on Track: 5 Helpful Questions for more on the two useful questions that can snap you out of a overly serious state of mind. Itâ€™s very easy to spend your time thinking and imagining all the horrible things that may happen if you stand up and face your obstacles and troubles in life. But if you actually do that those negative images seldom come into life. They are just huge monsters that you build in your mind. Just like you did when you were a kid and imagined monsters in the closet or under your bed. When you actually stand up and face your obstacles you may find that the experience isnâ€™t as bad as you imagined. Sometimes itâ€™s actually a bit anti-climatic. You think to yourself: â€What?! Is this it?â€. So, after having done some thinking, research and planning on how you can accomplish something just stop thinking. Donâ€™t fall into the trap of overthinking and monster-building. Just go and do what you need to do instead. Talk to people, do some research â€“ in books, online, etc. – and the mist of anxiety and fear often vanishes. A situation may seem scary because itâ€™s not understood and undefined and so your mind projects your worst fears upon that scary looking mist. It can seem like just about anything may jump out of it and attack you. So understanding can be useful. Overthinking, as mentioned in the previous point, not so much. Self-fulfilling prophecies can be very powerful. If you think that you will fail then youâ€™ll find â€œproofâ€ that you will fail in your reality. If you think you will succeed your focus system in your mind â€“ your Reticular Activation System â€“ will help you find the opportunities for success in your reality. What would remain â€œin the backgroundâ€ when you focused on the negative will suddenly pop out of the background when you focus on the positive or succeeding. Now, it may be common or â€œnormalâ€ to focus on the negative (perhaps with a sprinkle of positivity now and again). But it is also all it is. You are free to choose what to focus on all the time. So think about what you focus on because that is what you will see. And what you see is what you will act upon. And your actions do to a large degree determine your results. Problems can provide insights and give lessons in how you can grow. So donâ€™t be totally discouraged when running into a problem. Realize that there are usually one or more opportunities in what you perceive as a problem. Doing that regularly makes it easier to not take your problems overly seriously because you arenâ€™t seeing them as totally negative experiences anymore. So when facing a problem, ask yourself a question like: whatâ€™s awesome about this situation? Or ask yourself: what can I learn from this situation? 8. Donâ€™t go too fast. Itâ€™s tempting to go fast. But if you go too fast your boat may tip over. You may stumble unnecessarily and make mistakes that you wouldnâ€™t have done if you had just kept a slower pace. Or you may be tempted to grab on to the next big idea, the next â€œmagic pillâ€, instead of steadily keep going on your current path. To actually get where you want to go a slower pace may be more useful and effective than a hurried and quick pace. What you spend most of your time thinking about you tend to become. One problem may be that you donâ€™t know what you think about most of the time. If you for instance try a Positivity Challenge you may find that youâ€™ll spend a lot more time on negative thoughts than you imagined. Such a challenge or just keeping careful notes for a few days can be useful to find out how you spend your time and thoughts. To install more of a positive attitude or positive thinking into your mind you need to have patience. It may not be easy and youâ€™ll probably fall back into old thought patterns a lot of the time. But I have discovered that over time â€“ weâ€™re talking about months here â€“ you can slowly spend more and more of your week with, for instance, positive thoughts rather then negative ones. And after a while positive thoughts tend to become more and more automatic. Just like when playing tennis you donâ€™t have to think so much about striking the ball after a while. It becomes an automatic reflex. It is here we can find perhaps a crucial detail or something that we did that we missed the other 10 times we tried. So, as Peale says, donâ€™t get totally lost in basking in your glory. Or make the mistake of seeing your success as just having a bit of luck for once. Take a close look at what happened and what you did right. Preferably sooner than later as memories can quickly become a quite fuzzy. And write down what you come up with to prevent that the conclusions become fuzzy.